Joe Millage and Jeff Tieseen of the ParaSport of Ontario are welcomed by President BJ to our morning meeting. Both gentlemen spoke about a tremendous organization of ParaSport Ontario. Their mission is to provide support to all members of the disability community – regardless of age or stage in life – to find, connect with, and participate in competitive and recreational sport programs and activities of their choice to enhance physical function and quality of life. see https://www.parasportontario.ca for details. ParaSport Ontario is presenting the ParaSport Festival at the Scotiabank Convention Center this April 11th and 12th. They need volunteers so please contact Nancy T for details. Kevin Gibson (center) of ReMax Reality presented an excellent review of where house sale and prices are in the Niagara Falls Market. All members showed a selfish interest. "What will my place sell for?" Jim Sissons and Dennis Gilmore kept Keven after the meeting to get more particular information. No one was spared the wit of Santa's helpers this year. That is overwhelming news. I expect to see Yasmin Albano Garcia and Ariel Lazaro Martinez tomorrow, we are going back to the community tomorrow for a free medical clinic in the school, this will be a first time collaboration between HeliSOS the Air Ambulance/Search and Rescue company, and Power at Work. Both kids should be there and I may meet their parents and many siblings. I have met Elsa and hope to get a picture with her. Elsa is third year high school and in bilingual secretary program. Both Yasmin and Ariel have been high performing students, Yasmin top of her class since kindergarten. She wants to be a teacher and he wants to be a lawyer. Ariel a very good student and best goalkeeper for many miles around. Thank you again, this has been very exciting. 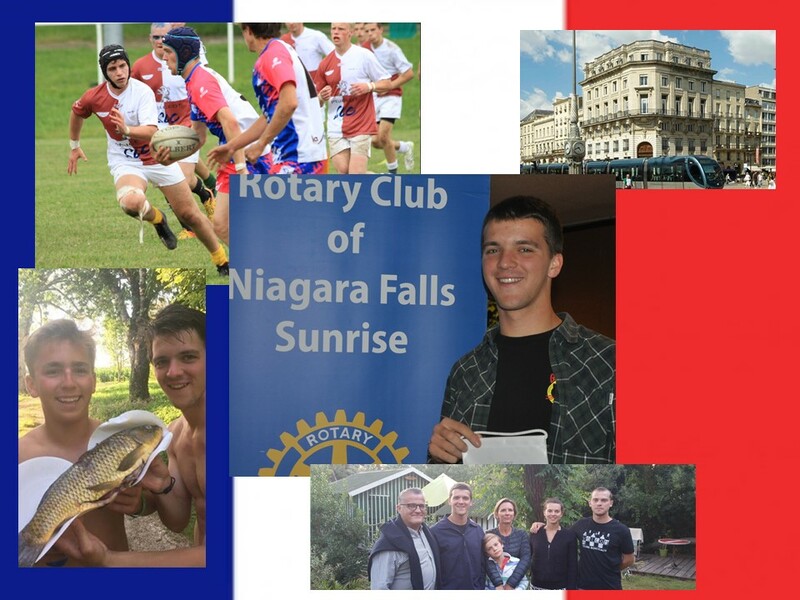 At our Oct 25th meeting, our Exchange student Alois Coupry presented some details about his life back in Bordeaux France. School in France is not the same as it is here, with classes from 8 am to 9 pm. But Alois makes up for this with an active interest is rugby, fishing and time at the beach. He has 1 sister and 2 brothers. His dad is a banker and mom teaches little ones. When asked he said that after high school he might go to college for Business. We were all so pleased to to have Alosi join us. He is a wonderful young man. As a result of this last Catch the Ace lottery done by the Niagara Falls Club and the Niagara Falls Sunrise club, we presented to Kim Rossi, the Director of Philanthropy for Pathstone, a cheque for $3,721. At our Sept 6th meeting, we were honoured to have Donna Christe of the Niagara Regional Sexual Assault Centre enlighten us about the Centre's accomplishments. The NRSAC provides counselling though out the region for Women and men that have experienced sexual assault at any time in their lives. There is such a demand for these services that Donna has to sometimes tell desperate inquiries that there will be a 6 month wait. Her many volunteers assist in such programs as a 24 hour Crisis Support phone line and a Hospital Response Program. The Niagara organization was the first Canadian group to initiate CAPP. This is a Child Assault Prevention Program designed for giving school children 'Lifetime strategies" in dealing with assault. 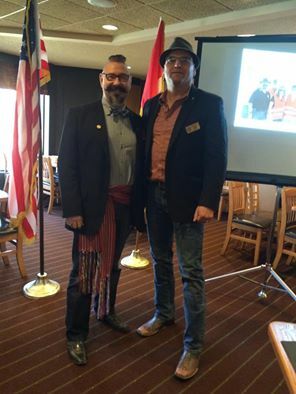 Our own Brian Kon presented a fascinating talk this morning on his proud Metis Heritage. Did you know that there are only 400,000 Metis in Canada? The aboriginal Nations of Canada consist of the First Nation, Inuit and Metis nations. These three groups are enshrined in the Canadian Constitution (1982). It's too bad we only had 20 minutes. There was so much more that Brian could have explained, to us all. Thank you Brian for helping us understand our "Canadian Heritage Moment". The 2018 Rotary medalist Emily Hilborn, Braden Sargeson, Silvana Nguyen and Hunter Murdoch. All surrounded by the people that shaped their lives and their future...... their parents! It was a beautiful Day to Plant 40 trees in Fernwood Park. Our club not only contributed $1,000 to wards the 40 trees but also put in Sweat Equity. Rotarian Jennifer Schoenhals presents the cheque to the Catch the Ace winner Leonard Belanger of Niagara Falls. Leonard selected lucky envelope number 7 when his ticket was drawn. It contained the Ace of Spades, so Leonard now has a $1,634. Based on the number of tickets and the 50 cards left, the odds of this happening was 1 out of 15,800. The committee has agreed that the entire proceeds or $1,234 will be donated to the Rotary House for youth. Thank you all for helping. Next Catch the Ace will hopefully go beyond 3 weeds! Under the watchful eye of President Harry Walker, Dennis Gilmore and Jim Sissons (Center) present a cheque for over $23,000 from the 2017 Mega TV Auction to Treasurer Bob Smith. This was the first year that the auction used the internet based auction and Dennis was pleased to report that our 'yield' was up this year, even though the total bid Value was down slightly. Next year, because we are using the internet that is accessible to all households, the effort will be to increase both values. 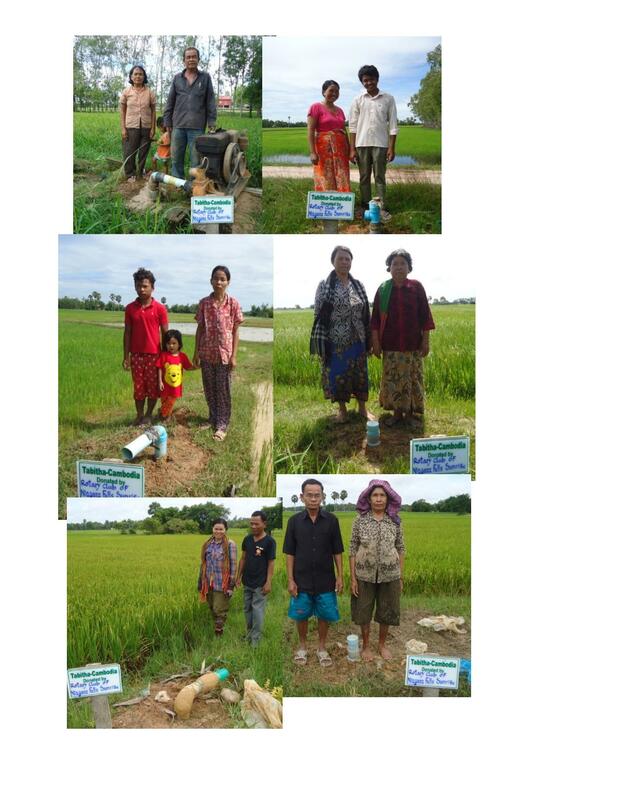 Please find attached photos of the 7 field wells that your Rotary Club’s donation has made possible. These families will now be able to generate an income year round, having water for irrigation.. An income they never thought possible. On behalf of Tabitha Foundation Canada I would like to thank your club for your very generous donation, one that will continue to go on giving. The Presence and Power of youth was again demonstrated this morning though our speaker Jasmine Yaromich. In 17 years, this young lady has accomplished so much to demonstrate the leader she will be in the future. Her speech started by explaining the drive she had even as a four year old to help others and do what was right. If that was not enough to convince us of her powers, she completed her speech by giving us the TED Talk she presented at her school. For those not present it is a 'must see' on Youtube... https://youtu.be/4jf-Lgnd__k Jasmine is a victim of sexual abuse. Her speech explained how through therapy, friends, faith and family she was able to recognize that this was not her fault; that she was a victim, that could become a victor. We were all impressed with this young lady. She has demonstrated her leadership in the community, her church, and her school. She has received a differed admission to the University of Waterloo, for a Bachelor of Social Work, because next year she will be in Australia doing leadership training and then hopefully will travel to Thailand for missionary work. What a great candidate for a membership in a Rotaract Club when she returns. Michael Brown reported that he discovered a new fundraiser while traveling through the Guelph area. No members at the meeting believed that he would buy just one and bring it to the club unopened. 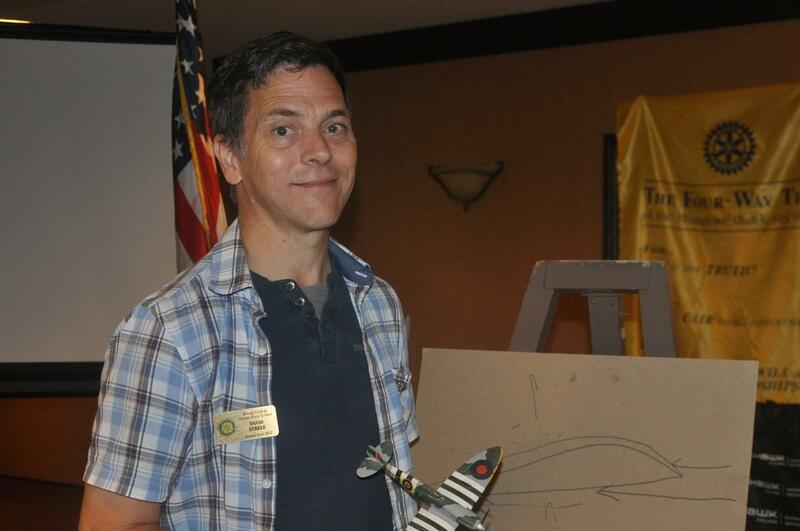 Proud Rotary Member Dave Sebel, had a dream to get back to flying. As a teen and a member of the Air Cadets, Dave got his gliding and VFR licenses. It was a passion that gave him hundreds of hours in the air and pleasure. Now a few decades later, he has requalified and is back in the air. Thank you Dave for sharing your excitment. Welcome to our Family..... Anna Antalfalvi, our exchange student is from Kecskemet, Hungary. She is a self proclaimed extrovert, happy and sometimes loud person. She loves the outdoors. Her mother is a University professor and father is an Environmental expert. She has a half brother and two half sisters. Anna is looking forward to being a new member of our Rotary family. Two weeks ago, The Rotary Club of Niagara Falls Sunrise honoured the memory of long-time Rotarian, Rev. Dr. Ken Smith with a plaque at Patrick Cummings Park. Pictured here are Ken's widow Rose, his daughter Fiona and her husband Ted. 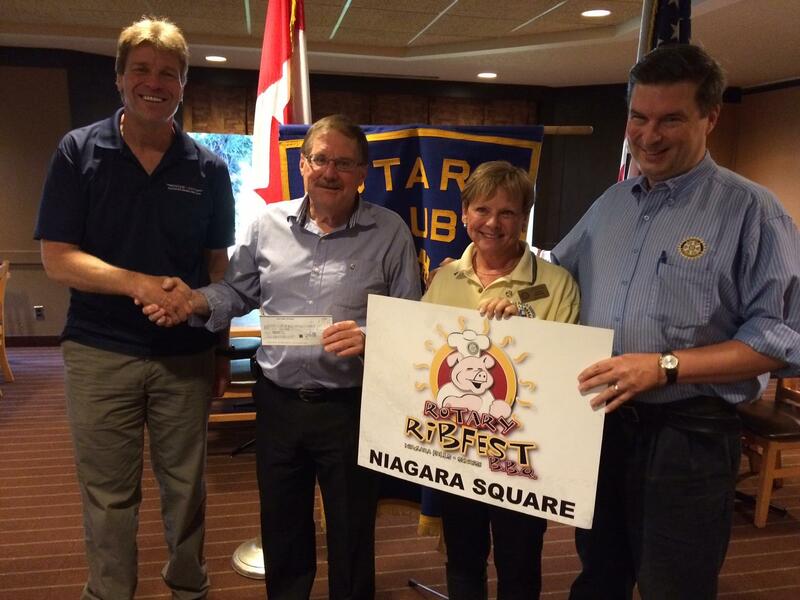 The Rotary Club of Niagara Falls Sunrise was happy to donate $2,000 to The Hotel Dieu Shaver. Our donation was used to purchase this piece of equipment that will help patients, like our own Wayne Gilmore, on their road to recovery. The Rotary Club of Niagara Falls Sunrise honoured the memory of long-time Rotarian, Rev. Dr. Ken Smith by dedicating a bench plaque to him at Patrick Cummings Park. Pictured here are Ken's widow Rose, his daughter Fiona and her husband Ted. 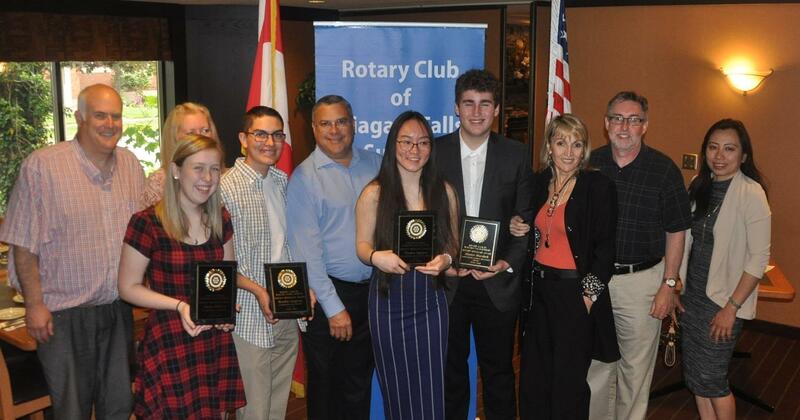 The Rotary Club of Niagara Falls Sunrise and The Niagara Falls Rotary Club hosted a gala evening to present The Paul Harris Award to Rotarians and members of the community that have made an outstanding contribution to their community. It is the highest honour in Rotary. 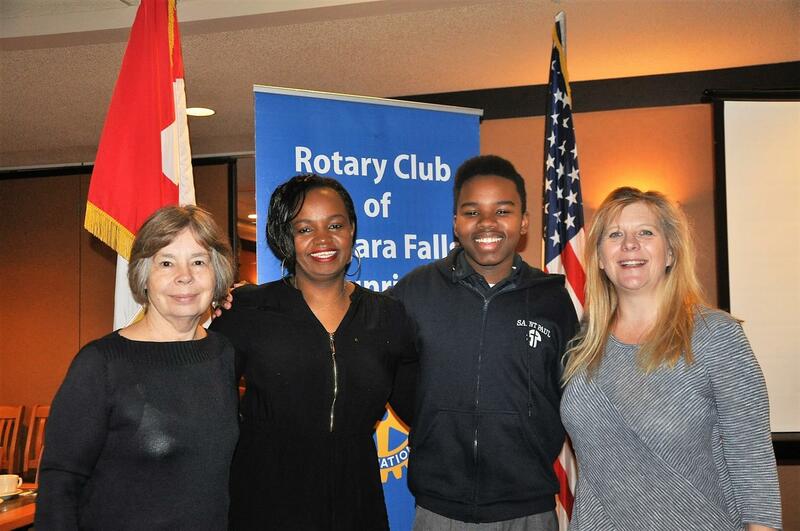 The Rotary Club of Niagara Falls Sunrise is proud to announce that James Maina has been chosen as our Youth Exchange student. James will be leaving for France later this summer. Congratulations TO Chuck Hodgson 50 years of Rotary Service! 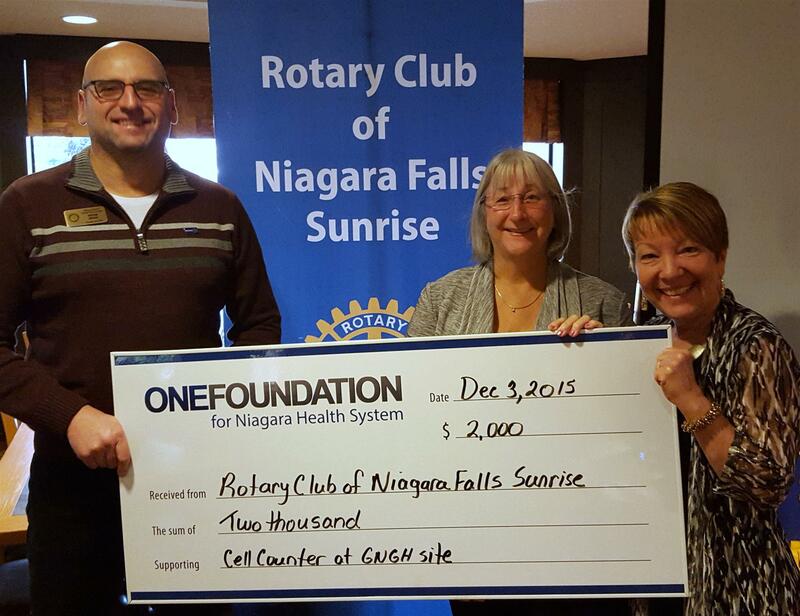 We are proud to have you at our Rotary Club of Niagara Falls Sunrise. It was so nice to see your family celebrating us you this morning. All the best! On February 23/17, The Rotary Club of Niagara Falls was proud to present the ONE FOUNDATION with a cheque for $3500 for the purchase of a laser for urology at the GNGH site. The Rotary Club of Niagara Falls Sunrise was privileged to have welcomed Ayman Krait, a Syrian refugee who now proudly calls Niagara Falls and Canada home to our Breakfast Meeting. Pictured with Ayman is BJ Romans, Vice President & Membership. 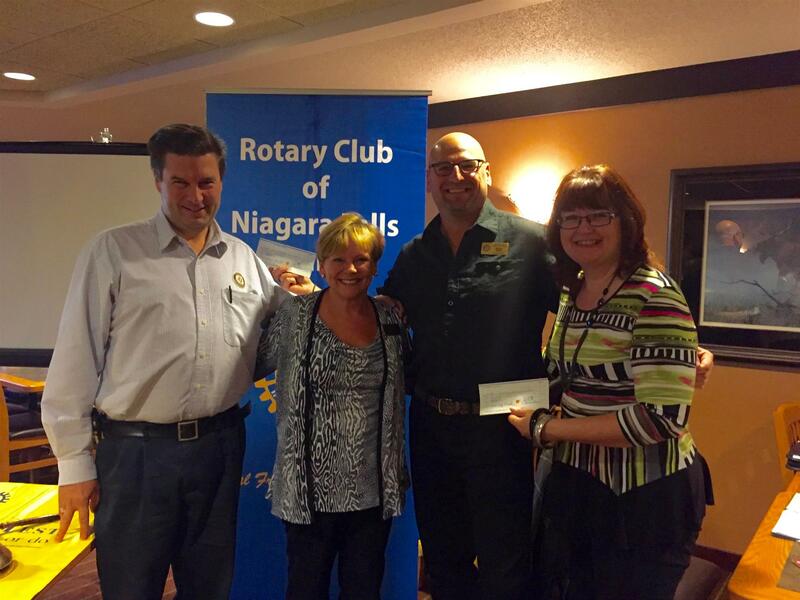 Last week the club was joined by Oksana Fisher, CEO of The Niagara Children's Centre. The Niagara Children’s Centre is a children’s rehabilitation centre serving children and youth with physical, developmental and/or communicative disabilities. The NCC's primary services include physiotherapy, occupational therapy, speech language pathology and social work. At the end of Ms. Fisher's presentation, we were shown an incredibly moving video of the wonderful work that this organization does. On December 20/16. 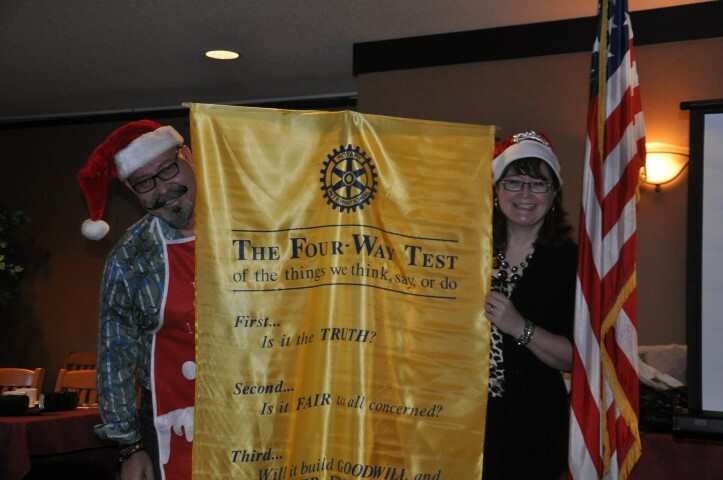 the two Niagara Falls Rotary Club's came together for fellowship, fine dining, and holiday cheer. The view of the falls was breathtaking especially with the lights shining on them. Elements was an incredible venue as the food was outstanding. We were treated to some Christmas entertainment by a local bell-ringing choir. And most of all, we were graced by the presence of legendary Rotarian, Wayne Gilmore. At our last meeting of 2016, Santa sent his two best elves to spread holiday cheer and distribute presents to all of the good boys and girls of Rotary. For more photos you can visit the Gallery section on the website. Last week the Club was joined by Executive Director, Betty Ann Baker and Program Coordinator, Dave Young from Niagara Peninsula Homes. The agency works to empower people within communities to help themselves through a process of training, planning and evaluation. Their training and certificate programs and employment assistance are designed to help in the development of education programs in the business, construction and food industry sectors. Their goal is to link a skilled and motivated workforce with various community projects in need of assistance. EXTRA CHANGE When you come to Thursday's meeting, please bring a little extra change for the servers at Betty's that take such good care of us during the year. PAUL HARRIS AWARDS: An email was sent out earlier this week re: nominations for the Paul Harris Awards. The deadline for nominations is January 31, 2016. The potential recipient must be present to receive the award. The email will be sent out a few more times as a reminder. Contact President-Elect Harry Walker: harry@onestopfireplaceshop.com. SANTA AND HIS ELVES: Since Santa hasn't read any of his daily briefings he totally forgot about tomorrow's meeting. In his stead he will be sending his sassy elves to spread goodwill and holiday cheer. Last week the Club was joined by Frank Adamson of KwikFit Niagara who took part in The Peleton Challenge from Toronto to Miami. The Peleton Challenge brings together a group of cyclists who take part in a 7 day 24 hour relay ride from Toronto to Miami, in support of Wellspring Niagara. Since inception the Wellspring Peloton Challenge has raised over $2 million to help Wellspring continue to provide vital cancer support programs, at no cost, to people living with cancer and those who care for them. CHRISTMAS PARTY: If you are interested in attending this year's Christmas Party, please login in on our homepage and then go to the left-hand side of the screen. You'll find a section called UPCOMING EVENTS. Deadline to register is DECEMBER 10TH! BOARD STRUCTURE: President David Berry has emailed the proposed new Board Structure for the 2017-18 Board. Please take a look at it and be prepared to share any comments or concerns you may have about it at tomorrow's meeting. TV AUCTION: Thank you to everyone who volunteered to make the 2016 TV Auction a big success. There is a collection of photos from the event on our homepage in the Gallery section at the top of the screen. Last week the Club was joined by Dave Martineau, Director of Sales for The Business Link Newspaper and their series of other publications. However, Dave came to tell us all about his recent foray into the world of acting. He told us about the audition process, on knowing that he got a part or when he knew when he didn't. It was very interesting to hear about just what happens behind the scenes in the entertainment business. Dave has an put together an impressive list of credits including movie and television roles. I have attached a brief report on our 2016 Summer Camp Program which was supported by The Rotary Club of Niagara Falls Sunrise. The attached report on our Summer Camp and testimonials from parents demonstrate how important contributors such as your service club are to the success of the program. You will see that the Club was recognized as a contributor and hear from parents about the impact Summer Camp makes on the quality of their children’s lives during the unstructured weeks of the summer. It also shows how much family life is impacted when a family member with autism is engaged and given the necessary supports to succeed and be active in the community. On behalf of the families who participated in Summer Camp, thank you. Unfortunately our guest speaker, Melisa Schrok who was scheduled to discuss her international Rotary experience in Africa, was unable to make it as she had to tend to an important family matter. Sign in on our homepage and then go to the left-hand side of the screen. You'll find a section called UPCOMING EVENTS. 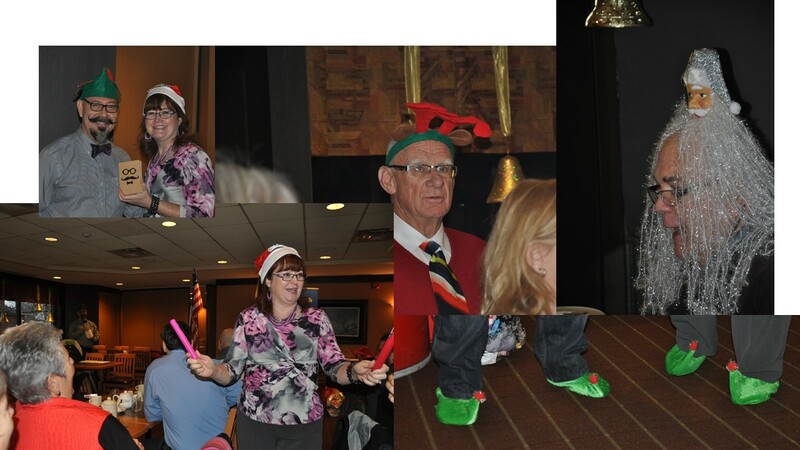 Click on CREATE A VISION FOR ROTARY as well as CHRISTMAS PARTY. And while you're there, you can click on TV AUCTION VOLUNTEERS WANTED to sign up for the days and times you are free to volunteer. FINAL CALL: The Rotary Foundation Grant Management Seminar. Nov 19, 2016 at 08:15 AM - 02:15 PM. $10.00. Americana Conference Resort and Spa. 8444 Lundy's Lane, Niagara Falls, ON. Pre-Registration required, including ONLINE payment in full. To register, please go to the District 7090 web site, scroll down the left hand side to this event to complete the registration. VISION MEETING: By now you should have all received an invitation in the mail containing information about our Club Visioning session. We will be holding our meeting on Wednesday, Nov. 16,2016 from 5:30-8:30pm at Johnny Rocco's (Lundy's Lane/Dorchester). Cost: $20 and cash bar. The morning meeting for the week has been cancelled. To register, please visit or website and click on the Upcoming Event (left hand side): 'Create a Vision for Rotary." Select "Members" to register online. You can also email David Berry at dberry@cogeco.ca. THE FLASH: Congrats to Peter Feren for completing The Niagara Falls International Marathon. Next up the Summer Olympics in Tokyo in 2020! Last week the club welcomed Shirley Cordiner, Executive Director for the Niagara Safety Village. The NSN creates a safe and controlled environment in which to provide safety education to the residents of the Niagara Region, with our priority being the school-aged children of our communities. We work in partnership with the Niagara Regional Police Service, Regional Fire Services and Niagara Emergency Medical Services. TV AUCTION: all items must be entered into the wizard by Friday Oct 28th. If you do get a late item before Friday you can still enter it into the wizard and include it in the auction. If you are having troubles entering the items into the wizard please contact Scott Glover. This past weekend David Berry, Nancy Tkachuk, and Scott and Karen Wright attended The District Conference in Batavia, NY.Food Packages: The Club purchased 100 packages and will donate them to Project Share. The conference made around 30,000 packages. Since the start of this initiative through a couple of Rotarians, over 400 Million packages have been made and distributed. We will be joining The Niagara Falls Rotary Club at Elements on the Falls (Table Rock). It will be held Tuesday, December 20, 2016. More information will be coming soon and a sign-up sheet will be made available. Minutes from previous Board meetings are posted on the right hand side of our home page. I usually enter them a week after each meeting. Last week the Club was joined by City Councillor Carolynn Ioannoni who discussed her two week World Vision mission to Tanzania (Africa). World Vision is a child-sponsorship program that teams with a sponsored child’s community to help bring essential needs to strengthen the child’s whole community: education, literacy courses, clean water, health care, sanitation, and infrastructure, such as building bridges and roads. During her visit, Carolynn was witness to many heart wrenching scenes as well as some of the positive strides that the people of Tanzania have made. Tomorrow is the deadline for submitting items for the auction is tomorrow, Oct 20th and the Wizard is closed Oct 28th. Wayne says that you can use his van because is easier for him to get into. He insists that he will pay the parking. All you need to contribute is a 2 1/2 hours and a book to read for the hour. Please email Wayne at wgilmore@cogeco.ca or phone 905-354-9014. If you have contacted Wayne, please copy David Berry so he knows that there is a response. The club has been given 6 complimentary tickets to the 10th anniversary performance of the Momentum Choir on Nov 13th (3pm) If you ate interested please contact David Berry: dberry@cogeco.ca. Pictured below are the students from Vietnam, Kazakhstan, and Denmark as well as Canada's Ambassador to Kazakhstan Borat Sebele. CHRISTMAS PARTY: Last week it was announced that we have been invited to join the Niagara Falls Rotary Club at their party which will be held at Elements (Table Rock) on December 20, 2016. Cost will be in the $45 range. We need to see who's interested soon as we need to let our fellow NF Rotarians know if we will be joining them. I would like to apologize for comments that I made a couple of years ago on the way to a Rotary event with Billy Bush. It was just innocent "locker room talk". Last week The Club was regaled by the remarkable life story of our own Doug Frazer. Doug's involvement in countless entrepreneurial and charity endeavours has led to some richly deserved honours from his business peers and community leaders. TV AUCTION: Just a reminder that October 28/16 is the cutoff date for your donations for the auction. We have the potential to make this year's Auction the biggest and best one yet. CHRISTMAS PARTY: Last week it was announced that we have been invited to join the Niagara Falls Rotary Club at their party which will be held at Elements (Table Rock) on December 20, 2016. More information about the event will be sent out shortly and membership will have an opportunity to voice their opinions. The Board is looking to finalize plans for a Strategic Planning Meeting/Dinner in mid-November (location, cost, etc.). Details to be made available soon. Tomorrow The Club will welcome Doug Frazer as our guest speaker. VIP Meet and Greet Packages are now available. Last week The Club welcomed Angela Arsenio, Executive Director for Victim Services Niagara. VSN works to ensure that all victims of crime and tragedy receive the emotional support and practical assistance. they need. This includes: On-site early intervention and crisis intervention, Safety planning, Referrals to community services, Provision of cellular telephones for eligible victims and System navigation for vulnerable victims. Information about our 2016 Christmas Party will be made available very shortly. it will include location, cost, menu, etc. We received an email from The Rotary Club of Ancaster A.M. looking to see if anyone has any connections for delivering the following to the Dominican Republic: 10 boxes, averaging 40lbs each and measuring 24"-24"-16" consisting of mostly backpacks, and some paper, binders, calculators, pencils too. if anyone has any connections to get these donations to the Dominican Republic contact Jack DiSalvia from The Ancaster A.M. Club. Congrats to The Niagara Falls Rotary Club Sunrise Ribest Committee for raising $48,000 ($3,000 will go to the Rotary Foundation) at this year's event. Pictured here from left to right are Committee member Chris Ross, Club President David Berry, along with Ribfest Co-Chairs Nancy Tkachuk and Scott Wright. Congrats to The Niagara Falls Rotary Club Sunrise Ribest Committee for raising $48,000 ($3,000 will go to the Rotary Foundation) at this year's event. Pictured here from left to right are Committee member Chris Ross, Club President David Berry, and Ribfest Co-Chairs Nancy Tkachuk and Scott Wright. The story about our visit to Wayne Gilmore at Hotel Dieu Shaver was posted in the September 2016 District Newsletter. I will work on having content to send them for the monthly newsletters. At tomorrow morning's meeting, Ribfest Co-Chair Scott Wright will be sharing the details from this year's very successful event. Information re: Visioning Committee/Strategic Planning meeting will be made available shortly. We are looking at November 16 or 17 at the Optimist Club. Last week The Club was joined by our own Michael Brown, Area District Governor, who discussed the state of Area 8 and its member clubs. Currently the District is hoping to encourage more cooperation between clubs in order to garner more publicity and attract new members. This would also include having members attending meetings of other clubs to help foster better relationships and communication within the District. TV AUCTION: We encourage to keep looking for donations for the annual TV Auction. David Berry has forwarded a letter that can be used to approach local businesses in search of donations. DISTRICT CONFERENCE: Just a reminder that The 2016 District Conference is fast approaching. The event runs from Oct. 21-23 in Batavia, NY. Select registration dates are available at a reduced rate. http://www.districtconference7090.org/ for more information. STRATEGIC PLANNING: We are looking to hold a strategic planning session in mid November. We' are hoping to have Anne Birmingham who has a wealth of experience when it comes to strategic planning for organizations. We need a set time and place, and to have a robust turnout of members. David Berry will need 2 people to help him organize the session. Last week The Club was joined by District Youth Exchange Chair, Mike Taylor. Mike has extensive experience with the Rotary Youth Exchange program and shared both the challenges and successes of the program. As our club looks to get involved in the Youth Exchange Program once again, we look forward to having Mike's experience and knowledge as a resource. TV Auction: keep working on getting donations for the TV Auction. Our deadline to submit items is Oct 28. The Auction will be held on December 1st. President David Berry has sent out a sponsorship letter to assist you in approaching potential donors. David Berry has reached out to the Chair of the District Visioning Committee re: Strategic Planning. He would like to hold the event in mid Nov and has recruited Anne Birmingham, an ‎Organizational Development Consultant and Rotarian who would be excellent in this endeavor. We need a couple of people to help put this together and David is looking for volunteers to help. By the looks of this all we need is a set time and place, and get all members there. We need 2 people to help out or else this event will not happen. Contact David Berry ASAP if interested. Last week The Club was joined by our very own Don Cruikshank who discussed his trip to Ireland. 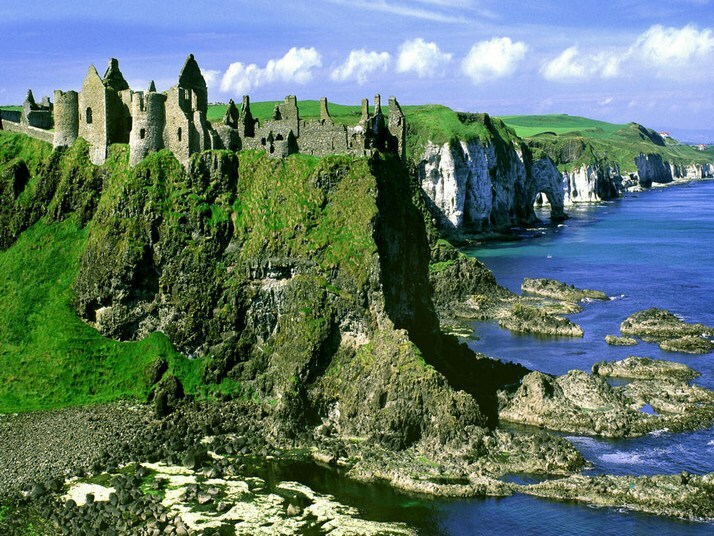 During his visit to the Emerald Isle, Don was able to gain a greater appreciation for the country's rich cultural and historical significance. Don was able to learn more about his family history and he may have even partaken in a little golf while he was there. TV Auction: keep working on getting donations for the TV Auction. Our deadline to submit items is Oct 28. The Auction will be held on December 1st. Rotary Leadership Institute (RLI): Saturday, September 24, 2016. Hillfield Strathallan College. Hamilton ON. REGISTER NOW (registration closes September 16, 2016) The cost for each part is $75.00 per attendee. http://www.rotary7090.org. 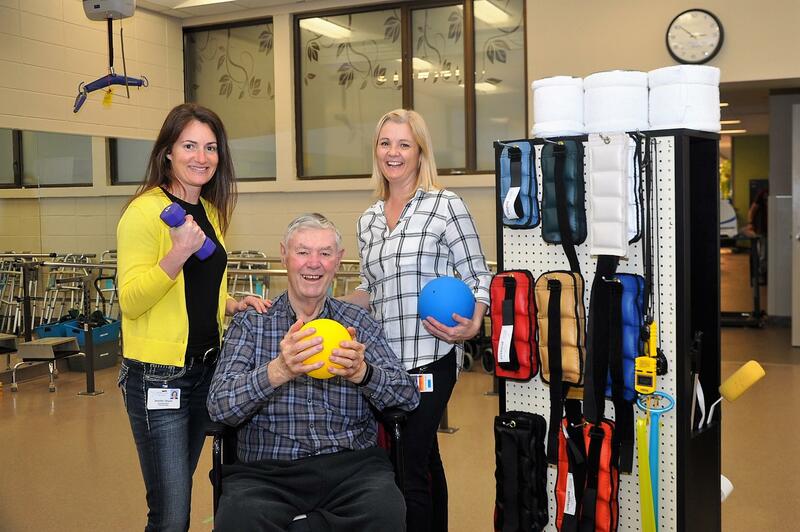 Last week The Club paid a visit to Hotel Dieu Shaver Health and Rehabilitation Centre to tour the facility and see our dear friend Wayne Gilmore. A $2000 donation was made to Shaver for taking such great care of Wayne and the other patients currently residing there. On August 25th, The Rotary Club of Niagara Falls Sunrise made a visit to Hotel Dieu Shaver Health and Rehabilitation Centre. The Club got a tour of the facilities and most importantly got to visit our good friend Wayne Gilmore whose presence at our meetings has been missed.. A $2000 donation was made to Shaver for taking such great care of Wayne and the other patients currently residing there. Last week The Club was joined by Emily Berry who discussed her experience teaching in the Bearskin Lake community. Emily was able to acclimatize to her surroundings following the inevitable culture shock that came with living in a remote part of Canada. It is important that we continue to pay heed to the triumphs and tragedies of our Indigenous peoples so that they are never forgotten about. The Rotary Foundation Grant Management Seminar. September 17, 2016 at 08:15 AM - 02:15 PM. $10.00. Buffalo, NY. An email has been sent out to membership. David Berry has signed up and we are looking for one more member to join him. Dave Berry has set up a sub page on the Club web site (www.niagarfallsrotary.com ) Go to home page, sign in and click on TV Auction on home Page Menu. As mentioned during last weeks meeting we are looking for a "Plus 3" effort this year. Three more donors from all members could mean an additional $9,000 to the club. District Conference 2016: Batavia Downs Gaming. Oct 21, 2016 12:00 PM – Oct 23, 2016 12:00 PM. www.districtconference7090.org for more details. Pictures of Sunday's festivities are on the homepage of our website in the Gallery section. When it comes to Pictionary, don't mess with Diane Kon! Scott Glover will be coordinating our efforts with the main TV Auction Committee, but we need someone to step up and help coordinate our club efforts. Please volunteer! This past Sunday, membership gathered for the annual President's Picnic. It was a wonderful afternoon filled with great food, drinks, games, and fellowship. Thank you to John and Joyce Morocco for being such gracious hosts. And kudos to the Committee that put the entire event together (Olya Makerweich, Tawnya Hartford, Dave Sebele, and Dan Mazur). President's Picnic: This Sunday, August 14/16. Festivities begin at 2PM. Cost: $30 (pay at the event). Dinner, drinks, games, fellowship, prizes, and possibly a shirtless Justin Trudeau. The event will take place at Joyce & John Morocco's home 4721 Lyon's Pkwy Niagara Falls ON. An email will be sent out very soon where you can sign up. Please note that there will NOT be a meeting tomorrow at Betty's due to the President's Picnic. Last week we received our TV Auction sponsorship packages from Scott Glover. If you did not receive one, please contact Scott: scott.glover@meridiancu.ca. We're still looking for someone to step up and help coordinate our club efforts. If interested, please contact President David Berry. Last week The Club was joined by Remax Real Estate Agent, Kevin Gibson. Kevin provided us with his intricate knowledge of the local real estate market. We were also privy to the eye-opening numbers associated with the current boom in home sales in Niagara. Reminder: There will be no Breakfast meeting next Thursday. From President David Berry: We will be receiving the TV Auction 'packages' within the week. These will include letters to remind past donors that we need them to contribute again. It's time to go after more! Scott Glover will be coordinating our efforts with the main auction committee, but we need someone to step up and help coordinate our club efforts. Please volunteer. Just a reminder for Ribfest Committee Members, there will be a meeting Wednesday, August 10th at 5:30 pm at Scott Wright's office. The link for The District Conference is WWW.DISTRICTCONFERENCE7090.ORG. Register now and save $25. Just a reminder that Ross Durdan and Dan Mazur have new email addresses. Ross' new email is ross@durdanlaw.com. Dan's new email is dmazur@myfastcom.ca. Both email addresses have been updated on ClubRunner. The Planning Committee for The President's Picnic met on Tuesday night and are close to finalizing the menu and theme for the gathering. The event will take place on Sunday, August 14th at the Morocco's. More information will be made available shortly. The cost is $30/person. A sign-up sheet will be made available at the Breakfast Meeting and on ClubRunner as well. Last week The Club was joined by Melisa Schrok, District Conference 2016 Chair. 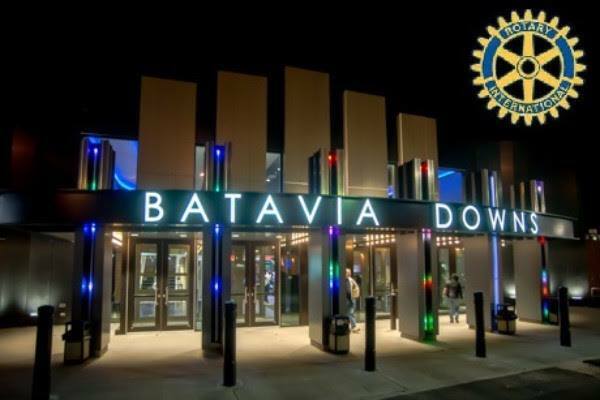 The Conference will be held at Batavia Downs (Batavia, NY) October 21-23. for a fun filled Rotary weekend packed with great guest speakers and educational breakout sessions. The District has added very unique "engagement" opportunities for Rotarians. 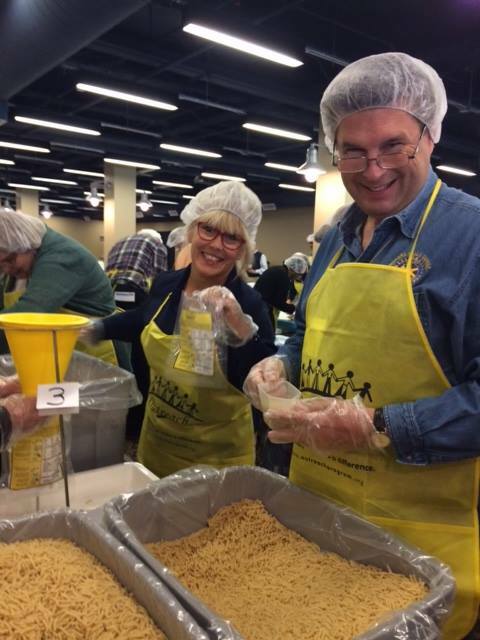 For the first time ever, The District will be working side by side, packaging 50,000 meals which will be donated back to local food banks in their area. President David Berry recently sent an email out to membership re: The TV Auction.We need a few good people to help Scott Glover. Scott will continue his position as the liaison with the main Multi-club TV Auction committee. We need someone to help and support the members of our Club to increase our return from the Auction. President's Picnic: Sunday, August 14/16 at Joyce Morocco's. Details coming soon. If you are unsure as to which POD you are a member of, just go to our homepage and click on POD Place. Let's continue to build upon the momentum of a highly-successful Ribfest and the general good will of The Club by making this our biggest and best year ever. As Melania Trump once said, “Friendship is a natural and willing servant. There is no reason why the great power of friendship should not be harnessed to do its part in the world’s work.” Or maybe it was Paul Harris. Last week, The Club was joined by Tina Saleh, a previous Rotary Exchange student (France). Tina spoke highly of the Exchange program and how about the impact it made it on her life. Tina is looking to use the incredible experience she had as an exchange student in her academic and professional careers. The President's Picnic will be held on Sunday, August 14/16 at John & Joyce Morocco's home. More information will be made available soon. An email was sent by President David Berry recently regarding PODs for the coming year. The PDF contains all the information about what POD you are in, the theme for the month, and the POD Coordinators. If you misplaced the email or have problems accessing it, just go to Clubrunner and under the menu on the left side of the members' home page is a section called "POD Place". A list of upcoming speakers for the remainder of July will be added shortly. Last week the Club was joined by Carling Wright and Carly Milani who discussed their RYLA experience - The enthusiasm of the two young ladies was palpable as they raved about the variety of fun and challenging activities they took part in as well the instant bond they felt with their fellow participants. Save the Date: "The Rotary President Picnic" will be held on Sunday, August 14th at John and Joyce Morocco's home. More information will be coming soon. The minutes from the previous Board meetings (dating back to November 2014) have been updated on the homepage and can be found in the right-hand corner. Pictures from the 2016 Ribfest have also been added to the Photo Albums section on the same side of the screen. Last week we welcomed the new Board of Directors for 2016/17. Incoming President David Berry discussed his vision for the Club during his presidency. David introduced a number of initiatives that he would like to see brought to fruition this coming year. Thanks again to Peter Feren for his commendable job as President. Tomorrow morning we will be holding our Club Assembly as Peter Feren closes out his year as President of the Club. The incoming 2016-2017 Board will also be announced. Congratulations to Peter on a fantastic year as President. Next month we enter.... ..The David Berry Era! Last week the Club was joined by Tom Rankin, Chief Executive Officer of Rankin Construction Inc. Tom shared the story of his humble beginnings, his years of hard work and dedication. As a professional engineer, Tom spent many years in highway and municipal engineering before becoming the co-founder of the company. Tom is also a big supporter of the community as his company is very involved many causes, including community sports teams, fundraising for area health care, the Rankin Cancer Run, United Way and Hospice Niagara. 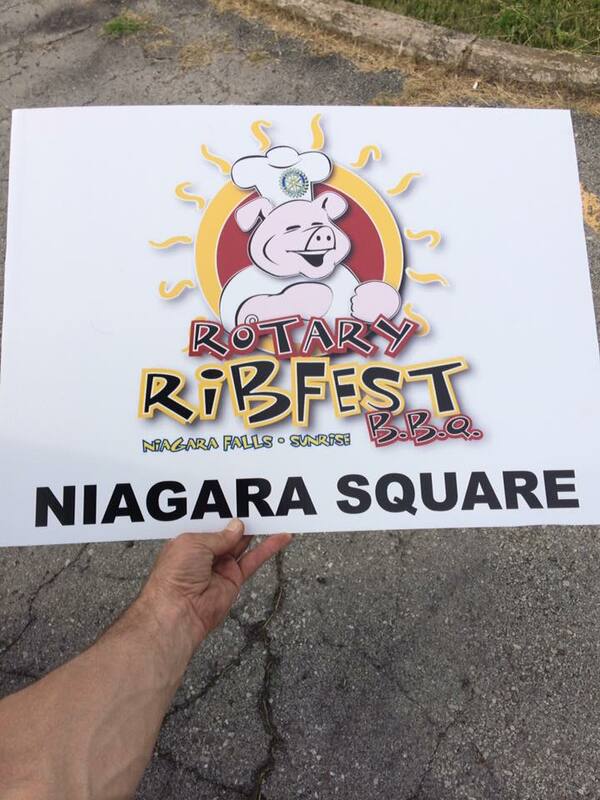 The Rotary Club of Niagara Falls Sunrise held its 12th Annual Ribfest during the weekend of June 17-19. Attendance was estimated to be well over 25,000 for the 3 day event. Beer, cooler and water sales were stellar all weekend, and ribbers reported one of the busiest Ribfests ever. 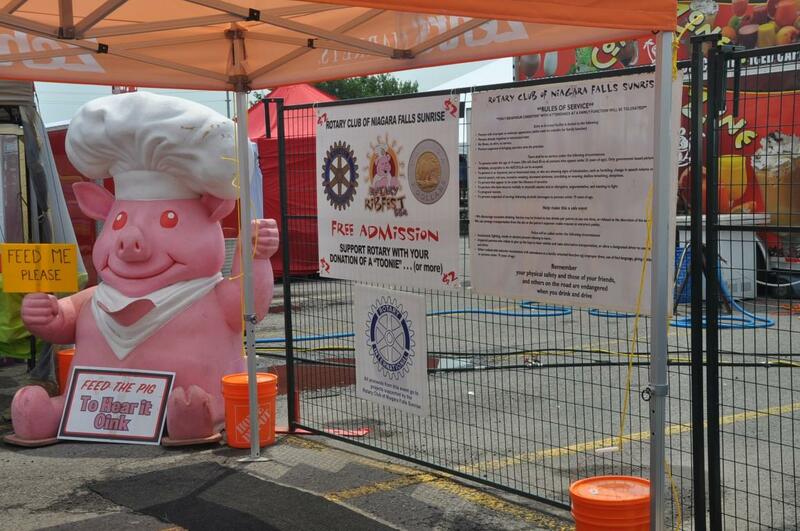 This past weekend we held our 12th Annual RibFest and it was a smashing success! It was an amazing weekend highlighted by beautiful weather, a great crowd, fantastic food and beverages, lively music, and a dedicated team of volunteers who worked long hours in the blazing heat. Congratulations to Nancy Tkachuk and Scott Wright for organizing another fantastic event! On our Rotary Club of Niagara Falls Sunrise District 7090 Facebook page you will find an article on the event by The Niagara Falls Review. TV Cogeco also covered the event and interviewed Peter Feren and Lindsay Dressel. The story has been featured on Cogeco throughout the weekend and this week. Last week the Club was joined by Diana Ferguson, Administrative Director for CrimeStoppers Niagara. Diana discussed the history of the CrimeStoppers organization and provided us with some useful information on the process involved in reporting a crime. All tips are anonymous, are sent to the authorities, and if leads to an arrest, can result in a financial reward for a dutiful citizen. 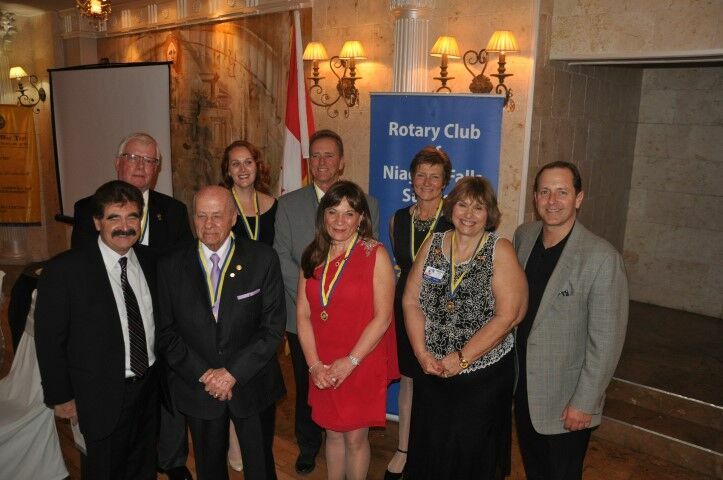 The Rotary Club of Niagara Falls Sunrise is proud to announce our Rotary Medalists for 2016. Each of the recipients are being rewarded for their academic excellence and dedicated volunteerism in the community. Representing Saint Michael High School are Amber Zupan and Kyle Lunn. Representing Stamford Collegiate are Rachel Dickinson and Garrick Phimister. As Rotarians we stand for peace. We stand for compassion. We believe in the power of good, and we believe that no need should go unmet. We stand together as the global leaders of humanitarian service. We come from diverse cultures. We speak different languages. But we don’t see our differences as a hindrance to what can be accomplished when we harness our differences to accomplish one goal - to serve others. There is no dignity in violence. There is no harmony in hate. There is no humanity in bloodshed. Through service, the Rotarians of the world continue to stand together for peace and understanding, abhorring violence wherever and whenever it takes place. Set up for Ribfest 2016 is 1 week away! Dave Berry has sent an up-to-date list of volunteers via email. He will be distributing a sign-up sheet at tomorrow's morning. We're going to need a lot of volunteers so talk to your friends, family, and colleagues about helping out with the event. Sign up online or sign up at a meeting. Tomorrow we will be honouring students from Saint Michael’s High School and Stamford Collegiate. Last week, the Club was joined by the OPG’s Steve Repergel who discussed some of the facilities that have been part of the community for decades, like the Sir Adam Beck I Generating Station (GS), which has been in operation since 1922. As a proud and engaged community partner, the OPG strives to make a difference and help improve the well-being of the communities that host its operations. The OPG remains committed to providing clean, renewable power on demand and when it is needed most. Last week the Club was joined by plucky young upstart and social media guru Tawnya Hartford. Tawnya also serves as the Club's Communications and Public Image Chair. Tawnya discussed the importance of social media and demonstrated how it can be used for personal and professional purposes. Using social media (Facebook, Twitter, et al.) to promote your businesses, non-profit organizations, and upcoming events is not the future. It's right now. Set up for Ribfest 2016 is 2 weeks away! Dave Berry has sent an up-to-date list of volunteers via email. He will be distributing a sign-up sheet at tomorrow's morning. We're going to need a lot of volunteers so talk to your friends, family, and colleagues about helping out with the the event. Sign up online or sign up at the meeting. RIBFEST 2016: We are a month away from Ribfest and need volunteers to help fill the various positions and timeslots we have available. The signup process is quite simple. Log into Clubrunner. Go to the homepage and click on Upcoming Events on the left-hand side. Click Ribfest. You will then see the layout for the jobs and times we need to fill from Thursday-Monday (including set up, tear down, and clean up). Choose the time and job that you want and sign up. If you are having problems logging in or signing up, don't hesitate to contact David Berry at dberry@cogeco.ca. Last week the Club was joined by Peter Papp, President of The Welland Rotary Club, joined us to discuss his club's involvement in donating a fire truck to the community of Bearskin Lake in Northern Ontario following a tragic fire. The people of Bearskin Lake had outdated equipment, a lack of fire hydrants, and an insufficient amount of fire alarms. Peter has also kindly agreed to provide our Club with assistance with the group of Bearskin Lake students who will be visiting Niagara Falls and Toronto in June. Ribfest 2016 is quickly approaching. We'll need all hands on deck for our biggest event of the year. Please go to our website and sign up to volunteer today! Tomorrow we will be joined by members of The Mississauga Credit Valley AM Rotary Club for our meeting tomorrow. Let's give our fellow Rotarians a warm and friendly Niagara reception. Last week the Club was joined by Dr. Suzanne Johnston, President of the - talking about the future of the Niagara Health System and healthcare in the Niagara Region. Dr. Johnston discussed the importance of building relationships and trust within the NHS and with the people of Niagara as well. The Rotary Club of Niagara Falls Sunrise participated in the Arbour Day event last week with the City of Niagara Falls at the Millennium Recreational Trail – Niagara Falls Lions Legacy Pathway today. 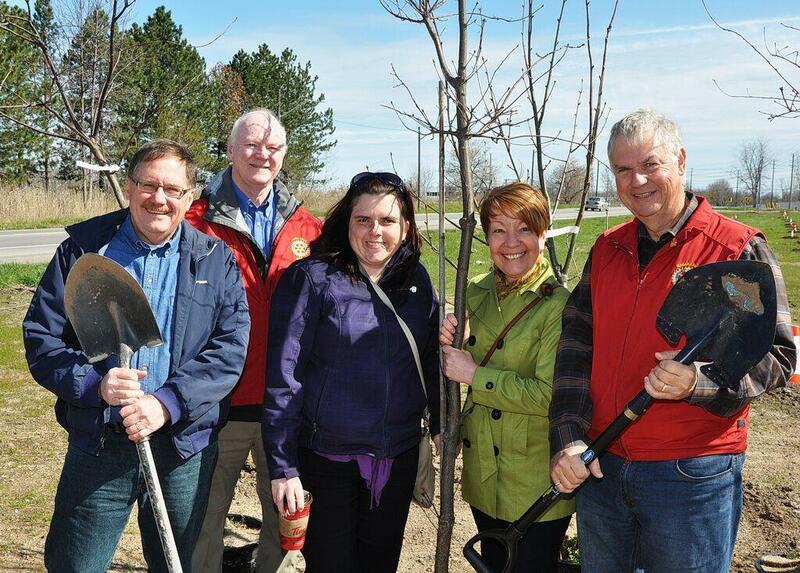 The Club contributed 25 Silver Maple trees in honour of our 25 year anniversary. WELCOME TO ROTARY RENEE AND DOUG! 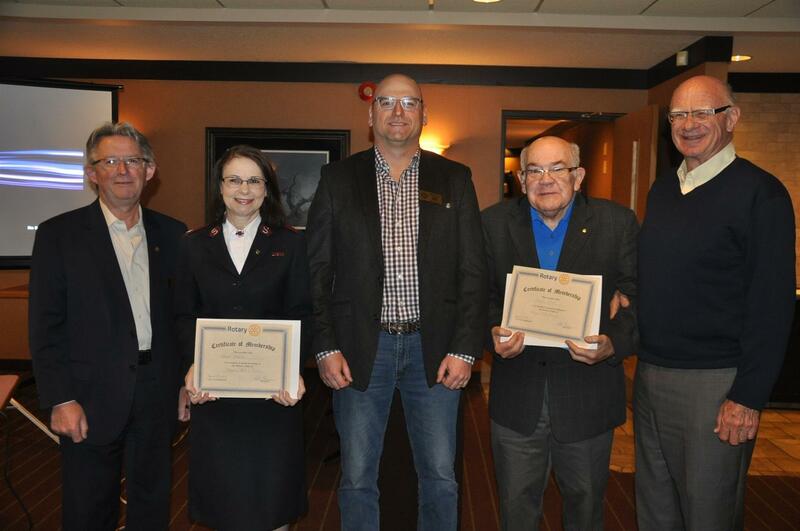 On Thursday, April 28/16, Major Renee Clarke and Doug Frazer were officially welcomed as members of The Rotary Club of Niagara Falls Sunrise. 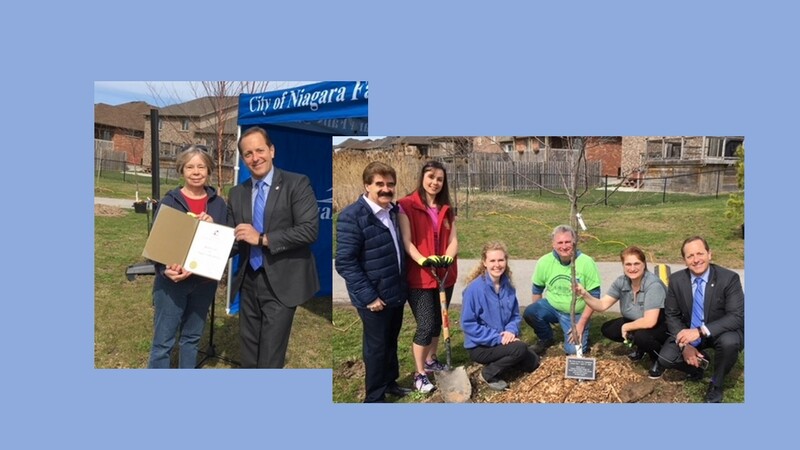 The Rotary Club of Niagara Falls Sunrise participated in an Arbour Day event with the City of Niagara Falls at the Millennium Recreational Trail – Niagara Falls Lions Legacy Pathway on April 29/16. Trees were donated and planted by Club members. From right to left: David Berry, Dennis Gilmore, Diane Kon, and Don Cruikshank. Tomorrow morning we officially (and finally) welcome Renee Clarke and Doug Frazer as members of The Rotary Club of Niagara Falls Sunrise. David Berry has sent out an email re: volunteering for RibFest. Please sign up and help make the event another big success. 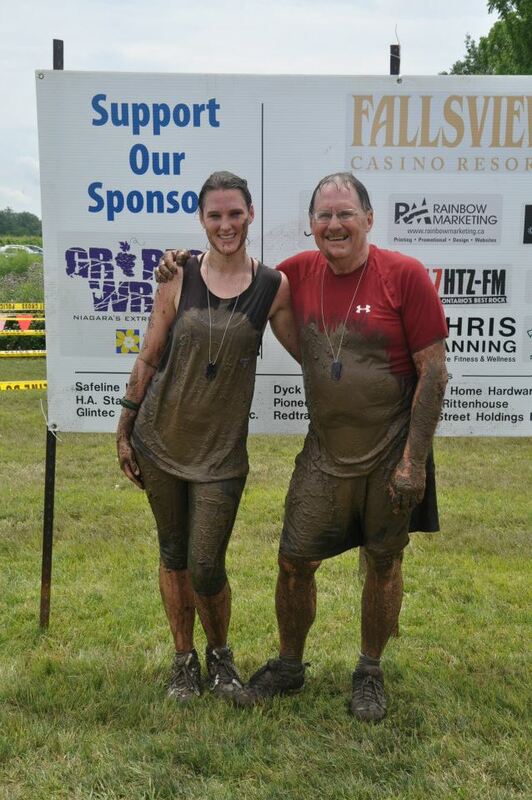 Peter Feren is looking to put together a team for Pelham's Mudfest Challenge. The event takes place May 14. Please RSVP by April 28th. Last week the Club welcomed Liz Palmieri from The Niagara Community Foundation as she discussed The Centre of Excellence in Non-Profit Governance. Launched earlier this year, the Centre's mission is to provide Niagara with a stronger non-profit sector. The Foundation hopes that by creating the COE that they will better be able to assist agencies in the non-profit sector who don't have the time, expertise, or financial wherewithal to address their governance issues. The Arbour Day Ceremony will be held on Friday, April 29th at 10 am with the tree planting being held at 10:20 am. The event is rain or shine and will be held at the Niagara Falls Lions Legacy Parkway. RSVP by April 26th if you are interested in participating. Our friends at The Welland Rotary Club are hosting The Annual Paul Harris Awards & Farewell Dinner on Tuesday, June 21, 2016. Cocktails are at 5:30 with dinner being served at 6pm. Tickets are $50. Tables of 8-10 are available. To RSVP please contact info@wellandrotaryclub.com. 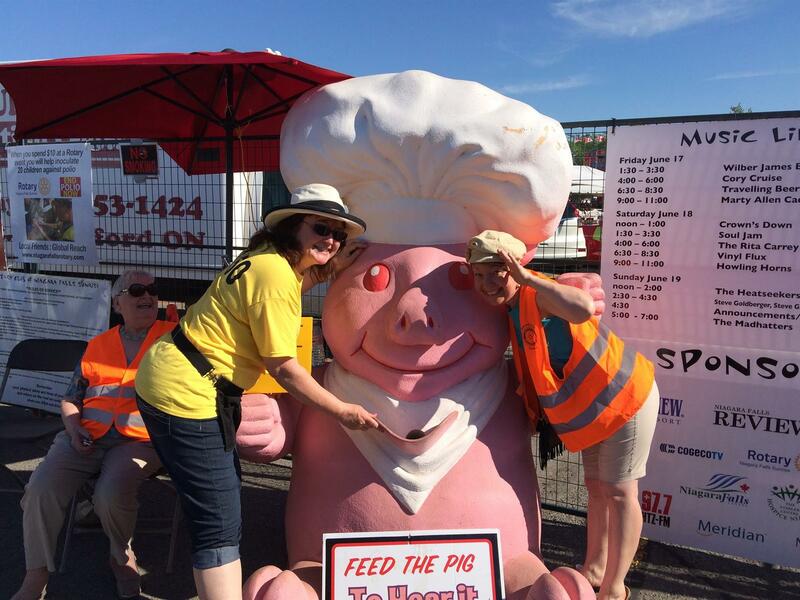 Volunteer sign-up sheets for RibFest will be made available soon. We need all hands on deck for our marquee event. This year's event runs from June 17-19. Congratulations to Brian Kon for being awarded The Paul Harris Award. It is a well-deserved honour as Brian contributions to Rotary and his community are boundless. It was a banner day for Brian as The Supreme Court of Canada legally recognized the Métis and non-status Indians as "Indians" protected under the Constitution. The Métis people are now entitled to Constitutional rights to which they had long been denied. We hope to see a good turnout for tomorrow's meeting as we present Brian Kon with his Paul Harris Fellowship Award. We will also officially be inducting Renee Clarke and Doug Frazer as members of our Club. The Arbour Day Ceremony will be held on Friday, April 29th at 10 am with the tree planting being held at 10:20 am. The event is rain or shine and will be held at the Niagara Falls Lions Legacy Parkway. RSVP by April 26th if you are interested in participating. The event flyer was sent out earlier this week and will be forwarded to membership next week as well. The Christmas by the Falls Committee presented the Club with a cheque for over $2000. It was also announced that last year's CBF would be the last. A new event is being discussed as a potential replacement..
Last week the Club was joined by Laura Ip, Resource & Development Coordinator for the YWCA. The YWCA Niagara provides shelter, food and assistance to homeless women in poverty while trying to break the cycle of poverty. The YWCA's goal is to help homeless women transition from temporary, emergency programs to permanent housing while providing integral life skills training. It is so easy for society to blame the victim for their misfortunes until one day, it happens to them. Annual Golf Tourney for Rotary Club of Niagara Falls Canada: We received an invite for our members to join the NF Rotary Club on June 29, 2016 at Grand Niagara Golf Club. $175/golfer which includes golf, lunch, and dinner. I believe membership received the PDF attachment, if not let me know and I can resend it. A reminder has just been sent out with all of the pertinent information about the Niagara Joint Rotary Luncheon. Deadline: March 31 to RSVP. Last week the club had the pleasure of being joined by Chris Watling from Niagara Falls Community Outreach. The "Soup Kitchen" is made up of volunteers from all walks of life who are dedicated to providing nourishing meals to anyone in need, no questions asked. Community Outreach also works diligently to help find temporary accommodations for those who have been displaced and need a warm, safe place to call "home." The organization is reliant upon the generosity of local churches, businesses, social clubs, the community, and through a series of fundraisers. NIAGARA'S JOINT ROTARY LUNCHEON REMINDER: Thursday, April 14/16, Registration: 11-11:45 a.m. Meeting 12-1:30 p.m., Guest Speaker: Former NHLer Steve Ludzik $25/person. We will also be awarding Brian Kon with the Paul Harris Award. The flyer for the event has been sent out with all the pertinent information. RSVP by March 31st! We have a new email address: nfrotarysunrise@gmail.com. Please use this email as the contact information for sponsorship letters and other materials. Club Secretary Dan Mazur will check the account for messages on a regular basis. Last week the club was joined by Lezlie Harper-Wells who shared some heartbreaking stories about those who made the harrowing journey to The Underground Railway. Lezlie was able to provide us with a real and unfiltered account of the barbaric slave trade and not the sanitized, revisionist version that we have been exposed to in school and through books. There is far more to this narrative than we could ever fathom. Just a reminder that if you're interested in attending Niagara's Joint Rotary Luncheon in St. Catharines on April 14, 2016, to please contact Peter Feren. The flyer will be sent out with the rest of the event information. RSVP by March 31/16. If you have a Facebook account and haven't liked the Rotary Club of Niagara Falls Sunrise District 7090 page, please do so. The page features a lot of insightful information about the great work that Rotarians do with some excellent videos and postings. Like the page and invite your friends to like it as well. Currently there is a great video about the Shelter Box program where you can see just how vital this program is to those in crisis. Our very own Tanya Hartford will be presenting a webinar on Social Media tonight at 7:30 pm. . The presentation will focus on Facebook and how your club can effectively use this social media tool to promote events and attract new members. To register please visit: http://rotary7090.org/ , click on the Get Ready To Grow link which will be found under the UPCOMING EVENTS listing on the left side of the main page. Last week the club was joined by Nikki Anderson who is a Youth Outreach Worker for the YMCA of Niagara's Youth Gambling Awareness Program. The Youth Gambling Awareness Program is a free service is designed to provide educational prevention programs and to raise youth awareness with regards to gambling, healthy and active living, and making informed decisions. Nikki discussed what's involved in her presentations to children include odds, probability, skill vs. chance, internet/online safety, dealing with peer pressure, media literacy, and harm reduction strategies. She deals with groups aged 8-18. Ironically Nikki won the 50/50 draw before informing us about the dangers of gambling. She donated the money to the Rotary Foundation. On April 9th, 2016, The Rotary Club of Williamsville will be holding our Annual Celebration at the Park Country Club in Williamsville, NY at 7 PM. Featuring Wonderful, Select, Wines from Premier Wines & Spirits and Food Prepared by the Park Country Club Kitchen Staff, our Annual Event is a Popular and Wonderful Evening. I personally am convinced the Evening, for $45.00 is an incredible value. You get a nice Party Atmosphere at a beautiful and exclusive Country Club's Main Hall, Live Music by Party of Nine, as well as wonderful wine and food, all inclusive. These Raffle Tickets are also available online and Facebook at above URLs. Thank you for your consideration and I hope to see you on April 9th at Park Country Club. Last week the Club was joined by recent Paul Harris Award winner, Stacey Allegro,‎ Outreach Nurse at Niagara Region Public Health. Stacey informed the club about the great need for public outreach when it comes to food, clothing, and medical care for the forgotten members of our city and society. Her work encompasses everything from dealing with those battling addictions to providing a warm meal and a hug to those in need. Thank you to the everyone who brought in donations of warm clothing and other necessities to support Stacey's work. This past Saturday The Paul Harris Fellowship Award was bestowed upon some richly deserving members of our community. We also celebrated one of own as Jim Sissons was honoured for his many years of dedicated service to The Rotary Club of Niagara Falls Sunrise and his tireless fundraising endeavours. Congratulations Jim! Recently membership received this warning from the District regarding a scam email that has been circulating. "A new email purporting to be from Rotary Foundation Trustee Chair Ray Klinginsmith is targeting Rotary members. The email falsely claims that members can become End Polio Now ambassadors if they email club information to a Gmail address within 48 hours. The fraudulent email has the subject line “BECOME AN END POLIO AMBASSADOR” and is sent from a fake email address. This is a scam. Avoid being the victim of scams by deleting any email that appears suspicious." That Russian "model" I've been sending money to is real though, right? Last week the Club welcomed our dear friend, Rose Smith who joined us to discuss ShelterBox. The program provides emergency disaster relief across the globe, delivering aid and shelter to those who need it most. 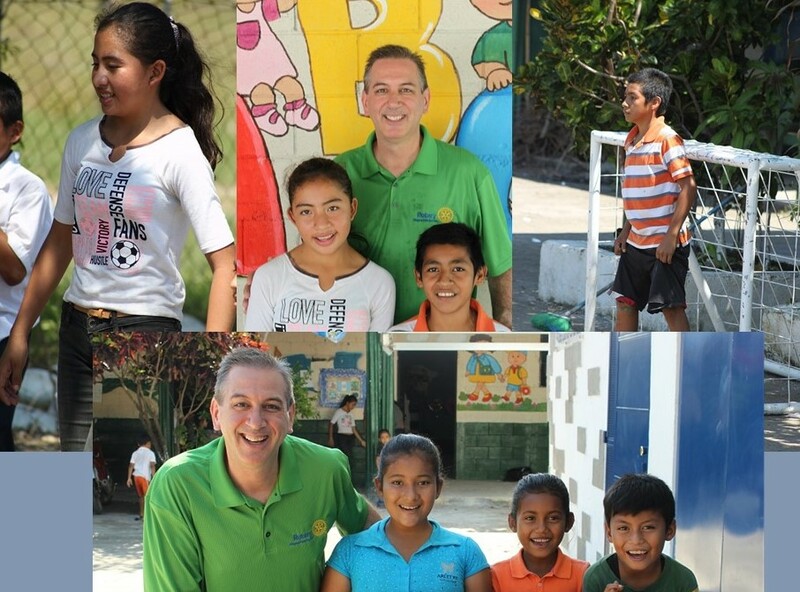 Founded in England, the program has quickly become the largest Rotary Club project in the world. Last week the Club was joined by Peter Warrack, Director, Risk Intelligence for BMO (Bank of Montreal). Peter has been a proponent of joint / law enforcement investigations and is actively involved with law enforcement in the legal sharing of information and best practices, which has resulted in numerous arrests and the interdiction of crime. Scott Glover has provided our final auction results: Net proceeds from the auction were $21,789!!! 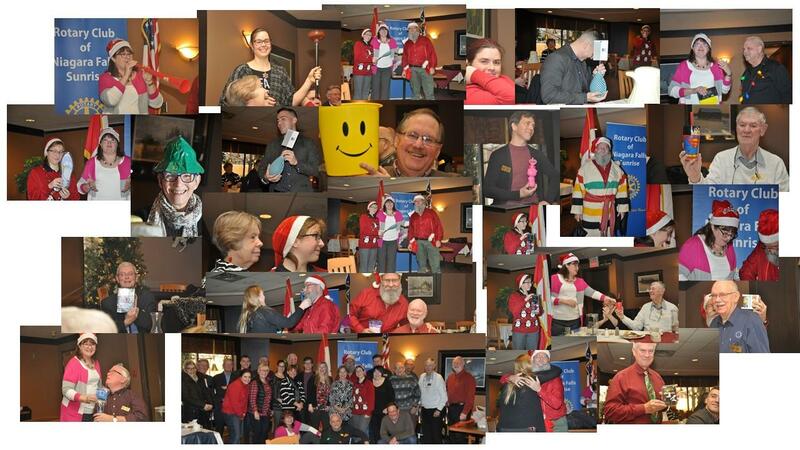 Fantastic work by everyone involved with the Rotary Auction this past December. Don't forget that Paul Harris Night will be held on Saturday, February 20, 2016 at The Best Western Cairn Croft Hotel (6400 Lundy's Lane). Tickets are $50/person. Cocktails are 6:30 with the welcoming address and dinner beginning at 7:30. Dress is business casual. For tickets please contact Tawnya Hartford at tawnsph@gmail.com or 905.2f96.8903. We are requesting that club members bring in warm clothing for donation in support of Stacey Allegro's work for Outreach in Niagara. Stacey is a Paul Harris Award recipient this year as well. We will be collecting donations throughout the month of February with Stacey scheduled to join us as our guest speaker on February 25. Two weeks ago, the club was joined by Phil Ritchie, Founder of Keefer Developments Ltd. KDL lead the private sector revitalization of downtown Thorold sites including; The Keefer Mansion Inn, Welland Mills and Book Depot. In 2010, KDL became active in the revitalization of downtown Niagara Falls. This role increased in 2012 with the acquisition of the Historic Niagara Development Inc portfolio. Phil is very passionate about preserving the heritage of Niagara while instilling a sense of community throughout the region. 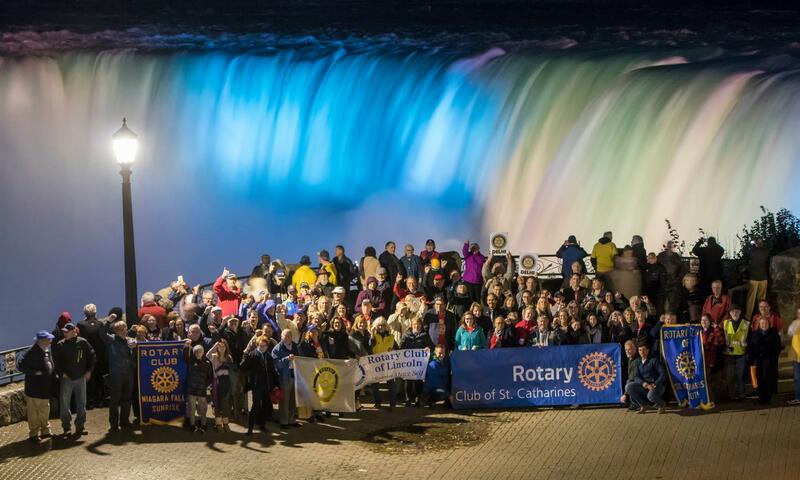 This past Saturday, The Niagara Falls Rotary Club Sunrise celebrated our 25th anniversary in grand style. 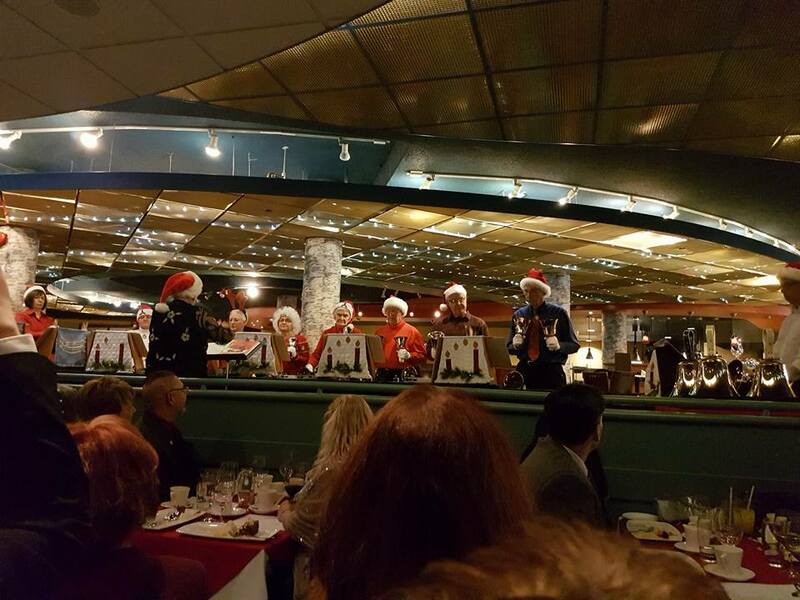 Held at The Niagara Falls History Museum, the event was a first-class affair that brought together Rotarians from the past and present to celebrate the wonderful work we do, the friendships that have been made, and our continued dedication to "Service Above Self". Kudos to Brian Kon, Olya Makerewich, and Tawnya Hartford for all of their hard work in organizing this amazing evening. We are requesting that club members bring in warm clothing for donation in support of Stacey Allegro's work for Outreach in Niagara. We will be collecting donations throughout the month of February with Stacey scheduled to join us as our guest speaker on February 25. -Official Rotary International theme for this current Rotary year is "Be a Gift to the World"
-How many countries are represented in Rotary International? 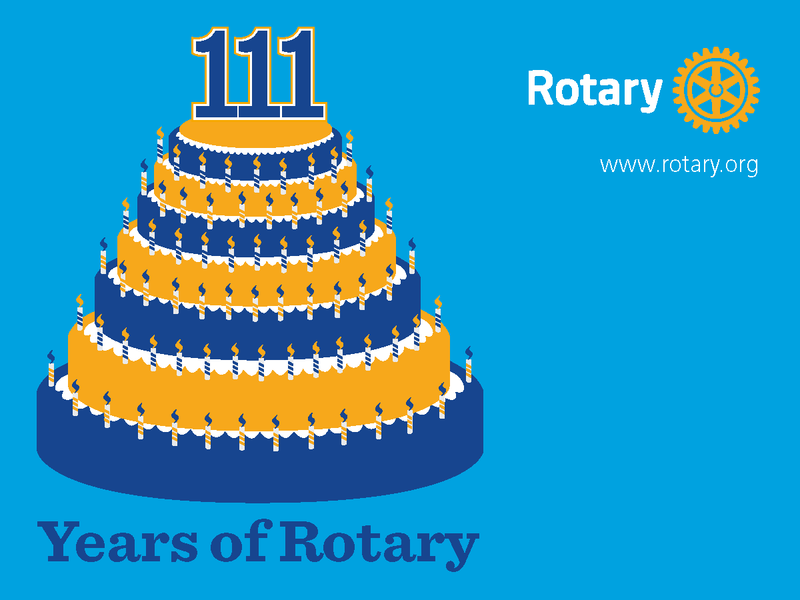 -Approximately how many Rotarians are there worldwide? -Current President of Rotary International is K.R. Ravindon “Ravi”. The RI President-Elect is John Germ. Thank you to Nancy Tkachuk for the wealth of information. Last week the Club was pleased to be joined by Joe Miszk, owner of Betty's Restaurant, home to our weekly Breakfast Meetings. Joe's family has owned the restaurant since 1967 and has seen Betty's go from 21 seats to a seating capacity of 500. Despite his many professional successes, his greatest source of pride comes from his involvement in coaching cross-country and track and field as well as his devotion to para-sports and the Special Olympics..
On Saturday, January 23, 2016, The Rotary Club of Niagara Falls Sunrise will be celebrating our 25th Anniversary. You are all invited to attend the event which will be held at The Niagara Falls History Museum, 5810 Ferry Street in Niagara Falls. The event will run from 7-10pm and will feature food stations, drinks, live music, and fellowship. Tickets are $65/person. Friends and family are more than welcome to join us. For more information please refer to the email that Brian Kon sent to membership back in December. To RSVP, email Brian, kon@sterlingfrazier.com or call 905.358.0746. 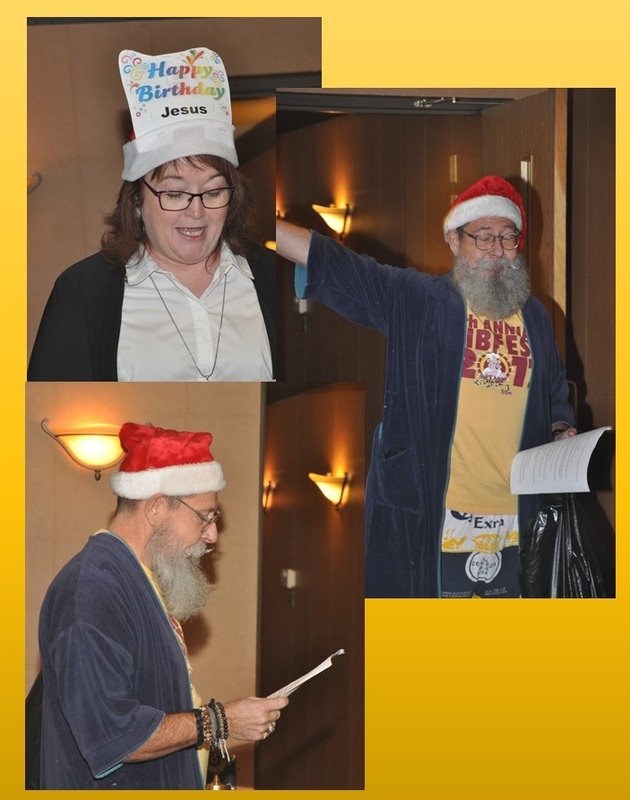 At our annual Christmas Breakfasting Meeting, the Club was joined by two of Santa's saucy helpers who doled out gifts to members, both naughty and nice. It was a fun morning as everyone enjoyed our final get together of 2015. Let's make 2016 even better for the Club and the world around us! Santa was very busy, so she appointed two of her elves to come to the Meeting and pass out the gifts. See Gallery for all pictures! We will collecting gifts for Project SHARE at our Christmas Meeting tomorrow. We usually collect gifts for teens, either girl or boy. Gifts should be unwrapped because of how they are distributed to clients You can receive a tax receipt if you put the bills in an envelope that has your name and address. If you would prefer to simply make a donation, please put it in an envelope with contact information so you can receive a receipt. Our next breakfast meeting will not take place until January 7, 2016. From all of us at The Rotary Club Sunrise Newsletter team, I'd like to wish everyone a Merry Christmas and a Happy New Year! Last week the Club welcomed Mike Farrell, Philanthropy Coach and Counsel, who discussed “Donor Fatigue, Over-Giving and Other Useful Maladies”- Michael talked to the Club about the causes and cures for these afflictions as well as philanthropy’s place in our lives and our communities. A very special thank you to all of the Club members who took part in The Rotary TV Auction and/or Christmas by the Falls. A lot of hard work went into planning and executing both events.Your many hours of volunteer service and selfless dedication to the Club and the community are sincerely appreciated. Mary Sergenese, Director of Community Outreach of the Niagara Health System Foundation, provided us with an overview of what's happening with the NHSF. We were also proud to present a cheque for $2000 to the NHS's One Foundation. Pictured here are Mary Sergenese, President, Peter Feren and Community Services Chair, Diane Kon. Mary Sergenese, Director of Community Outreach of the Niagara Health System Foundation was on hand for our December 3, 2015 Breakfast Meeting to accept a cheque for $2000 from our Club. Presenting the cheque to Ms. Sergenese are President, Peter Feren and Community Services Chair, Diane Kon. It was an eventful meeting last week to say the least. Dave Berry conducted an open forum based on notes from the District in which we discussed some of the ways we can improve the club, how to recruit and retain new members, types of memberships, and much more. This was the just the first of many more opportunities for membership to have their voices heard. We don't need to reinvent the Rotary wheel but we have to be open to new and bold ideas. Charles Wood, President of The Niagara Falls Rotary Club, was on hand for a presentation in which we were honoured by the District for our contributions to the efforts of Rotary to eradicate Polio. Peter received a letter from Thijs which he shared with the Club. He's doing quite well at school and has also secured a good job. The big news is that he will be returning to the Falls from December 18-29. Peter will be looking to plan a get together for Thijs and his Rotary family. If you haven't signed up to volunteer for the TV Auction or Christmas by the Falls please consider helping out with these important events. The Christmas by the Falls event is need of some volunteers. We need help setting up, working the event, and helping with tear down. Dave Berry previously emailed a link for membership to sign up to volunteer. If you were having difficulties signing in, another message will be sent shortly to assist you with the process. A sign-up sheet will also be made available at Thursday's breakfast meeting. The event runs on December 5th and 6th. We will need help with setup on the 4th (Friday). Last week the Club was joined by Tina Myers and Brian Ceschin from the OPG Winter Festival of Lights. They told of us about the many changes and exciting new displays and events that are being held during this year's festival. Their slideshow looked spectacular and I'd recommend that everyone in the Club take a drive down the Falls and take in the brilliant lights display. The Festival runs from November 21, 2015 - January 31, 2016. With the wounds from the Paris attacks still fresh in our memory, I think it is important that we continue to hold true to our core Rotarian values. Last week the Club welcomed Laura Shtern, Manager of Community Development and Programming and Chief Librarian at the Niagara Falls Public Library. Laura informed us about the many programs and services that the library provides to our community. The library is so much more than just a collection of books. It has evolved over the years and continues to be a vital service for young and old alike. Last week, the Club welcomed Shari Crickmore KidsSport of the Niagara region's organization. KidSport helps to raise money for grants that allows for kids to actively participate in sports without having to worry about the heavy financial burden that comes with registration fees, equipment, etc. An active child is a healthy and happy child. We have two big events running concurrently during the first week of December. The TV Auction runs December 3, 4, and 5 while Christmas by the Falls runs December 5 and 6. Sign up to volunteer or help promote these events to friends, family, and coworkers through word of mouth or by sharing information on social media. Let's tell the community about all of the great work that we do! Last week the Club was joined by Sara Fen-Thomas from The Escape Room in downtown Niagara Falls. The escape room is an interactive, live game where you’re a main character. You and your group discover puzzles, challenges, access secret areas and crack codes to unlock the final door and escape. Please keep in mind that we'll need volunteers for the TV Auction Thursday, Friday, & Saturday December 3, 4 & 5 as well as for Christmas By The Falls which runs on Saturday and Sunday, December 5 & 6. We will also be requiring help with set-up and teardown for CBT. Volunteer sign-up sheets will be made available soon. Last week, the Club was joined by Gem Munro, Director of the Amarok Society which provides educational programs to some of the poorest regions of Bangladesh, Pakistan, and Nigeria. We learned that despite living in a world largely devoid of hope and dignity, that the brave women who choose to pursue an education are not just surviving but they are thriving. They are a true inspiration to us all. 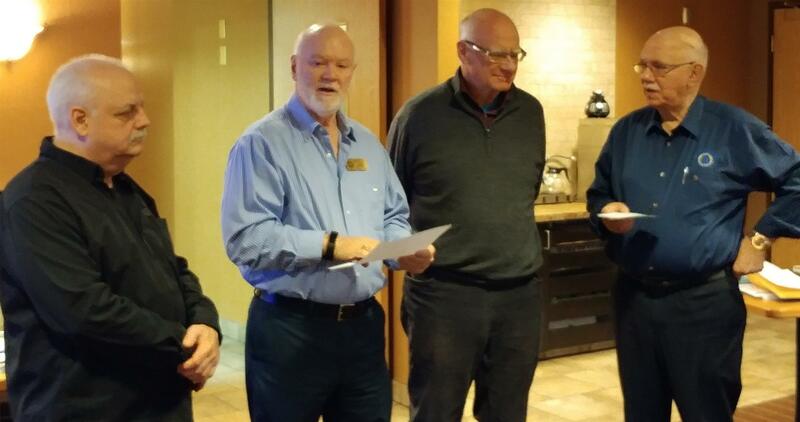 It was announced by President Peter Feren that long-time supporter and Rotary friend Fred Batson would become an Honourary member of the Rotary Club of Niagara Falls Sunrise. We are planning on sending a few members from our Club to attend a meeting in Buffalo to bestow the honour upon Fred in person. Last week, RibFest Co-chairs, Scott Wright and Nancy Tkachuk announced that the 2015 RibFest raised $35,000. Congrats to the RibFest chairs, committee, and all of the members who showed up to make this event a big success. .This year's RibFest cheque presentation. Pictured here are RibFest Co=chairs Scott Wright and Nancy Tkachuk presenting a cheque for $35,000 to President Peter Feren and Carrie Zeffiro, representing Pathstone Mental Health. Last week Brain Kon announced that our 25th Anniversary celebration will be held at the Niagara Falls History Museum in January of 2016. More details will be made available soon. Last week's guest speaker was Christina Riley, Emergency Management Program Specialist for the Niagara Region. Despite our best efforts, we were unable to guess the occupation of Wayne Gilmore's mystery speaker. Christina deals with a wide variety of emergencies in the Region ranging from power outages to floods. Last week, the Club was visited by a familiar face as Rich Merlino joined as our guest speaker. Rich is currently involved in trying to bring the Niagara Zip Line Attraction to Niagara Falls. The project will also consist of other adventure-based attractions that would run seasonally in Niagara Falls. Promote your Company, Club, Project or Fundraiser with an Advertisement in the District Conference Booklet. You will be seen by Rotarians and their guests from across WNY and Southern Ontario. We have over 350 people registered for the conference and more are registering every day! So if you want your company, your club, a service project or upcoming fund raising event to be seen, here's your chance! Tomorrow we will be welcoming Jeff Neale, a Rotarian visiting from Australia. He is from the Rotary Club of Campbelltown which is in Adelaide, South Australia. He's here visiting Niagara and was interested in joining us for our Breakfast Meeting. Last week, the Club was joined by Jessica Potts and Paul Tappay from The Pearl Gloves Charity Boxing Event. Jessica is one of the organizers of the event while Paul will be stepping into the squared circle on Friday, November 27, 2015 at The White Oaks Resort. The event has grown bigger and bigger with each passing year. All proceeds going to the MS Society Niagara Chapter of Hope. https://pearlgloves.ca/. In times of horrific human tragedy such as the Syrian refugee crisis, I take great pride in being involved in an organization that strives to not only better the community, but the lives of those who are struggling half-way across the world. The slogan "Service Above Self" knows no borders. Last week the Club welcomed Steven Megannety who enlightened us on the process and of the frustration that comes with lobbying. It is much more complex than just seeking out a local politician and trying to solve the problem at hand. We were also joined by special guest star, Chuck Hodgson's granddaughter London. We still need 1 more member to sign up for the seminar as we are required to have 2 representatives in attendance. $10.00/person - Pre-Registration Required with ONLINE payment in full. Last week the Club was privileged to welcome District Governor, Kevin Crosby. Kevin promoted the District Conference, which is to be held in Ellicottville, NY this coming October. You can view his humourous and creative video for the conference at: https://vimeo.com/107083306. Last week, Chuck Hodgson auctioned off one of his world famous apple pies to membership. Peter Feren took home the pie with his winning bid of $100. Last week the Club received an update from Public Relations Chair, Tawnya Hartford regarding the different social media strategies being used in order to promote Rotary. Tawnya also designed a new 25th Anniversary logo that we will be using on all of our correspondence. Dan Mazur also read his article from Niagarabuzz.ca about his first year as a Rotarian. Last week, the Club welcomed George Bailey who shared some stories about his new career as a Travel Writer. George has visited many exotic and unique locales during his lifetime. While he was with the Niagara Parks Commission, George got to spend time with Princess Diana and her sons William and Harry. How we put the Sunshine in Early Morning Meetings! 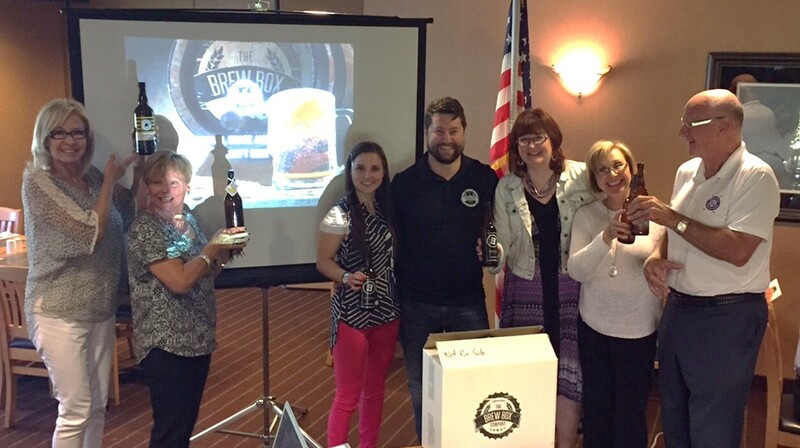 Our Guest Speaker this week was Robert Jackiewicz, the co-founder of the Brew Box Co. Yes this is 8:00 A.M.! but as a young entrepreneur, Robert demonstrated that knowing your product and it's market is critical to the success of any good idea. Robert explained the Craft Brew Industry complete from History to present day politics in Ontario. There have been some changes made to the PODs. Please refer to the email that BJ Romans, POD Chair,. sent to membership to see what POD you are a member of and what your duties will be. As always, keep your eyes and ears open for someone that you think would make for an interesting guest to address our Club. Quintin Wilcox returned from his year in Japan to talk about his unique cultural experience. He learned quite a bit about Japanese customs, the language, and the people during his stay. Despite being in a small, isolated Japanese village, Quintin was able to learn the language and gain a new appreciation for Japanese culture. Yes we all survived the Pelham Mudfest! Our Rotary Exchange Students. president Brian Kon (The only one with facial hair) and Michelle Zappitelli greet our two exchange Students. Quintin Powell (left) is on his way to Japan for a almost a year. Under the guidance of Michelle and BJ Romans, Quentin is prepared for it all. To his left is Thijs Schiebroek from the Netherlands. Thijs will be going to Stamford Collegiate for the year and will be staying with 3 or 4 different Rotarians throughout his stay. best of luck to both students on their exciting adventure. The message to the club was given by District Governor Jack Amico. Jack impressed on the membership the critical importance of the Theme presented by RI President Gary Huang ..... "Light Up Rotary".